Enrollment is defined below. To minimize errors and before starting any of the processes, please read this page entirely and carefully. The Enrollment process in Skyward is for students that have never attended a Pike Township school, therefore, have no records in our district and have no siblings attending Pike. Note: If at any point in time your child attended a Pike school and is now returning, you should Enroll. Children must be at least five years old on or before August 1 to enroll in kindergarten. You will need an original birth certificate for any child who is enrolling in the District. Your child’s legal name (the name that appears on the birth certificate) will be used on all official school records. We have created a simple step by step guide to help you through the Enrollment process. STEP 1 - If you do not know your school, go to the Bus Stop Lookup to select the correct school. 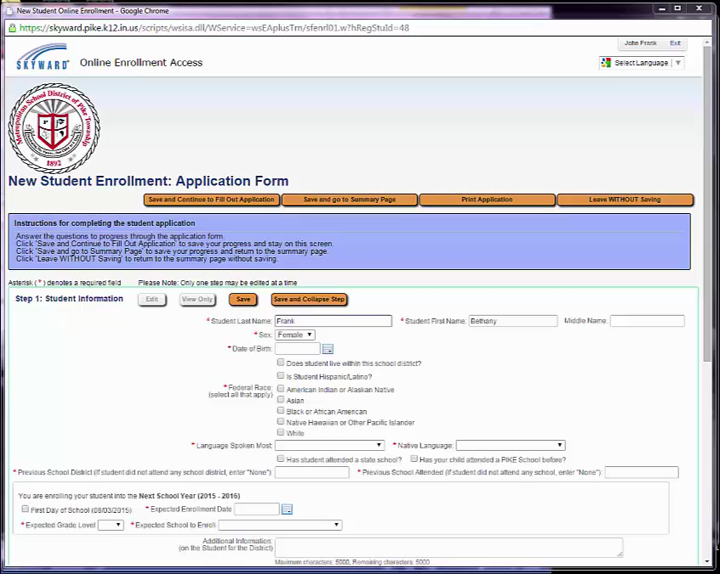 Step 2 – Access the Account Request Page for New Student Enrollment . Step 3 – An email will be sent with Username, Password, and a link to access the enrollment form. Step 4 – Fill out to its entirety the enrollment form.